During the period from 1890 to 1910, eastern Kentucky was famous for feuds. The eastern papers had followed the Hatfield-McCoy feud, exaggerating it into a notoriety and fame that remains to our day. Someone needs to write a chapter on the great migration from central and eastern Kentucky into Oklahoma during this same period, for people came in a surge, and a good number of them stopped in Lincoln County. In 1850, Missouri had 69,694 native Kentuckians living there. Indiana showed 68,651. Illinois had embraced 49,588 Kentuckians. Ohio gained 13,829 of our people and 12,609 had moved south to Tennessee. Iowa received fewer; 8,994 and Arkansas showed 7,428 Kentucky born people. Texas already had 5,478 Kentuckians and far-off California 4,690. This gives us an indication of the direction of the major migrations in 1850 – Illinois, Indiana and Missouri. . . .
By 1860, the largest migration was to Missouri; they had picked up nearly 30,000 more of our people. Texas had picked up from 5,478 to 14,545. Arkansas was slowly gaining Kentuckians in their midst and Kansas showed 6,556 native born Kentuckians. . . . California, in 1860, showed only 7,029 Kentuckians; Iowa had 13,204. . . .
By 1880 many Kentuckians were on the move. Texas and Kansas gained the most people; about 26,000 are shown on the census and approximately the same amount to Texas. 15,000 had gone to Ohio and to Tennessee (each). Indiana, Illinois and Missouri had past their peaks of Kentuckians. Other areas gaining population from Kentucky included the Indian Territory and Oklahoma. . . .
After 1900, within ten years, migration to Oklahoma grew stronger – the 1910 census shows 50,000 native-born Kentuckians there. Apart from Wilson’s work, there are period newspapers which report on the immigration. A useful source is the Lincoln County Oklahoma History, which prints an essay by Don Sporleder on the history of Davenport based on the news reports. Sporleder relates that in January of 1903 the Kentucky, Oklahoma, Indian Territory Company was incorporated in Lexington KY with the ambition of developing a town in Oklahoma or Indian Territory to be divided into one-acre lots for old and retired ministers. Advance scouts into the promised land were favorably impressed by the crossing of the Frisco and Santa Fe Railroads at Davenport, and soon the folks were arriving. The migration of the elderly ministers quickly turned into a movement of home-seekers, and they came for the next ten years. It was not long before Davenport acquired the nickname Kentucky Town. Came then the Kentuckians. First the ministers and after them the deluge. In the latter part of the flood (about 1912) came the Stidhams, poor farmers from Wolfe County, who were my forebears. The Embrys from nearby Butler County, who now enter our supporting cast, may have been poor too, but they were gentry--talented, educated, and ambitious--and they left their mark on Lincoln County. The first Embrys’ arrival preceded the great migration by a good ten years. The Confederate veteran Virgil Rice Embry brought his family in 1890, a year before the land run, and among them were Clinton, James, and John. Virgil’s second wife is buried in Lincoln County, but his first lay in Kentucky, and by 1910 he had returned there to eventually lie beside her. In 1910 Stella’s father, Clinton, was living in North Fox township, northeast of Davenport. He must have been a quiet man, a farmer with never enough money to own his own farm, but his brothers James and John were the Biblical Boanerges, sons of thunder. 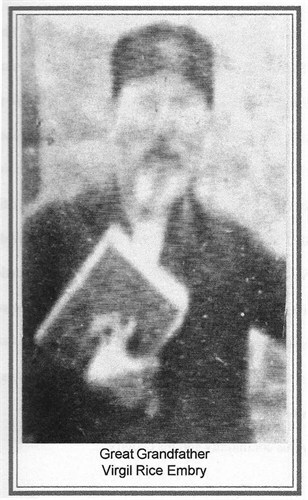 Of the two, John (1869-1960) left the stronger public record. Having taught school in Butler County before being admitted to the Kentucky bar association in 1890, he soon afterward came to Oklahoma and was admitted to the Territorial Bar Association in 1891. He served two terms as Lincoln County Attorney, 1894-98, and was also a county judge and the mayor of Chandler. He was elected to the house of representatives in 1900 and served one term. Appointed United States Attorney for Oklahoma Territory in 1906-1907, he served the Western District from 1907 to 1912. During that time he was instrumental in restoring the right to vote to the blacks who had been stripped of that privilege by the so-called "grandfather clause." The younger of the two brothers, James Embry (1878-1951), was educated in the public schools of Kentucky and attended high school at Chandler. His early life was devoted to farming and stock raising. He later took up the study of law with his brother John and was admitted to the bar in 1914. Like his father, he had a strong military record to his credit, having served for twenty months during the Spanish-American war. He subsequently served as lieutenant of the National Guard, and in 1916 was elected commander for the Oklahoma chapter of the Spanish War Veterans. James Embry’s practice was largely private, whereas his brother’s was political and public. He had been county attorney, true, but now he was known as a defense lawyer. It was he who would become the defender of his niece’s husband, Courtney Orrell. From the social niche where Embry stood, landed gentry with strong Kentucky roots, neither Billie Grayson nor her death counted for much. Who was she? The daughter of an auto mechanic who got herself killed while street-walking late at night. He won’t say that of Billie, since one does not speak ill of the dead. But he will imply it by saying as much to her companion Helen, chief witness for the prosecution. Where did Courtney Orrell fit into this class framework? Nowhere. Big Jim Embry probably gave no thought to the Orrells. There was nothing about them to make them stand out from their background. He would have known that Orrell’s father was a railroad man, and that Orrell himself had served four years in the Navy. Thus they were decent working-class people, but not any kind of gentry. But when it came to murder that didn’t matter. All that mattered was the tie of blood. Orrell had married an Embry, Jim’s cousin Stella.